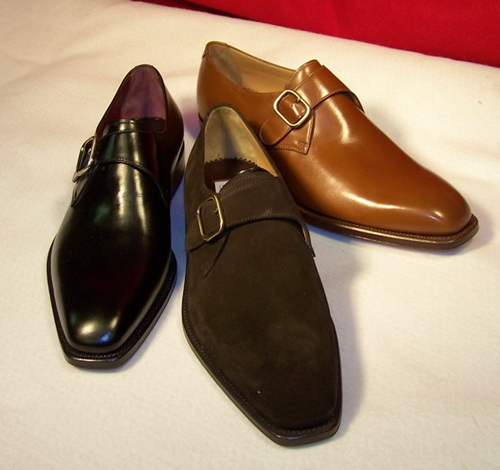 Monk straps are based on a design that has been around since the beginning of time. Or at least the dark ages, or maybe medieval times. They are, in fact, derivative of the buckled shoes worn by monks. The monks, however, could only hope to wear something as elegant as the versions available today. Although they are considered “casual,” The monk strap is actually a very practical “dress” shoe, in my opinion. The monk first gained popularity in the 1930’s and then caught on with service men, who wore them in polished brown calfskin with their class A uniforms. And, like all things “military” that have trickled down into the civilian world, the monk strap carries with it a bit of dash. Generally seen with a plain toe that contrasts with the rather sporty strap and buckle, the monk is a very easy shoe to dress up or down. The Churchill’s brown suede version has gained classic status and many fora members will argue that John Lobb’s Jermyn II model is the most sublimely elegant shoe that a man can own (although they may have ceased production of this model and replaced it with the Vale.) I think that with a bit of brio, the monk strap can be worn with a suit and tie, odd jacket and trousers or jeans and a blazer. The very definition of easy and elegant. The trick to enduring style with the monk strap is to make sure that the toe isn’t too chunky or boxy, the styling is kept to a minimum and the whole is given to a “sleek” look. No chunky buckles, no tractor tread soles, no “distressing” (ever, for that matter.) Pictured above are R. Martegani’s answer to the monk shoe. The brand is affordable (well compared to Lobb, anyway, whose monks will set you back about $1,300 at the current exchange rates) and will soon be available on-line. This entry was posted in Elegantology and tagged dressing, Elegantology, shoes. Bookmark the permalink. No wonder the monks vowed to a silence. These shoes leave me speechless. These have to be the most gorgeous monks I’ve ever seen. Most I’ve come across are on the dumpy side. I’m going to go right out and get a pair. Yes they are good looking. I have another pair of a slightly different last (elongated but rounded toe) from Ron at Martegani and have been extremely pleased with them. Do google “John Lobb Jermyn II” though…. wow! Funny, I’m wearing my pair of monks today on casual friday at work. I’ve had them for 10 years and they have a beautifully worn in leather and I always get so many compliments when I wear them! Very informative post. I’ve never warmed to monk shoes, for some reason. I don’t understand the appeal. They seem to be extremely popular on the style fora, but I’m still waiting to be convinced. Give me time. BtC, now you know they were a worthwhile purchase. 10 years and still going strong and getting the eye. I love these. I have such a shoe fetish, it’s insane. Hello Aesthete, yeah, me too. Can’t understand where it came from. Although my Dad had a pair of shoes made for me (my only bespoke) in Italy when I was a very young boy. Ron’s people do good work for the price. And he is very easy to deal with. This is an excellent post. I’m currently inclined to pick up a pair of Allen Edmond Park Avenues in brown myself. Outstanding stuff. If you want to save a ton of moneyt check out the samuel Windsor deal of hand made shoes as in the Sunday express offer (still On) .Bought two pairs then another four.sublimely comfortable for wide feet.get the Monks in Burgandy wear with light grey trousers. Believe me these shoes at 60 pounds for two pairs are really worth gettin.See my Blog THE WORLD on blogger.